When Wladimir Balentien first came to Japan from the Cincinnati Reds farm system before the start of the 2011 season, he vowed to give it his all in Nippon Professional Baseball, to secure a long future with his new team, the Yakult Swallows. Fast forward just two and a half years later, and Balentien is now a legend of sorts after breaking Japanese home run king Sadaharu Oh’s single-season home run mark of 55, a record that lasted nearly half a century. Balentien's 56th homer of the 2013 season came when he smacked a line drive over the center field wall in the first inning of the Swallows’ Sept. 15 game against the Hanshin Tigers at Meiji Jingu Stadium in Tokyo. He followed that a couple of innings later with his 57th home run. Balentien, 29, was born on the Dutch Caribbean island of Curacao. His nickname as a child growing up on the island was Coco, because his head resembled a coconut. He played for a local Little League team when he was 12 and signed with the Mariners in 2000 at the age of 16. However, his career in the majors was little more than mediocre, and he signed with the Swallows from the 2011 season for a fresh start. As an outfielder for the Swallows, Balentien found his groove, winning the Central League home run crown two years in a row, hitting 31 each year. In the last off-season, he signed a new four-year contract with the team. In the past, the performance of some foreign ballplayers has fallen after signing long-term contracts; a sense of complacency that comes with new-found job security is suspected to be the cause. Not Balentien, as he looked at his new contract as a sign that the Swallows franchise placed a lot of faith in him, and he felt he needed to respond in kind. Balentien speaks not only the local Papiamento language of his home island of Curacao, but also Dutch, Spanish and English. He said that he was able to adjust to life in Japan because he grew up on an island where different races and cultures live together. He is also attempting to learn the language of his new teammates and growing fan base, and is taking 30-minute Japanese lessons a day. Another reason for his acceptance by local baseball fans, according to U.S. author Robert Whiting, who has written extensively about baseball here and in the United States, including the classic "The Chrysanthemum and the Bat," is there have been important changes in how the Japanese view baseball today. 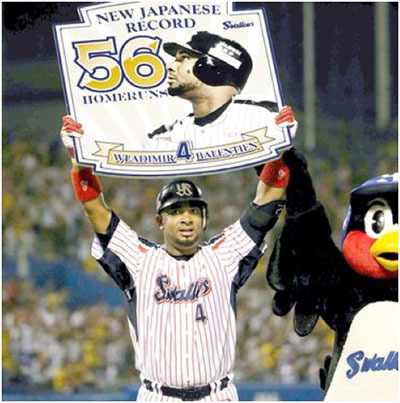 Whiting believes the catalyst for the change in attitude toward a foreigner breaking a long-held Japanese record and the local pride that goes with it came in 2004 when Ichiro, playing for Balentien's former team, the Mariners, set a major league single-season record with 262 hits. "The major league pitchers did not run away, and Japanese fans who witnessed that American spirit of fair play on TV came away with a different attitude," Whiting said.